Investigating the strange phenomena of five-fold symmetry. Sir Roger Penrose's quadrilaterals form non-periodic symmetries (no regularly repeating patterns) out to infinity. They're sold by the pod (see at right) of 5 kites, 3 darts, approximating the golden ratio, in assorted colors. 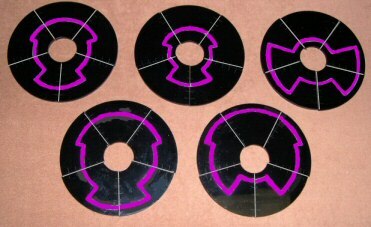 All-acrylic tiles measure 1.25 inches on their longer sides. The master set contains 40 pods (320 pieces total, 8 pods each of five colors) plus a handsome 16" vinyl game mat with the grid structure shown at left. For ages 10 to adult, 1 to 5 players. If these thick and thin diamonds had special markings on them to force certain adjacencies, they would represent Penrose's patented concept. We've left them blank so they can do Penrose's non-periodic tilings plus attractive kaleidoscopic variations. With 1.25-inch long sides, they're size-compatible with Kites and Darts above and with the Collidescape triangles below. Starter set has 4 pods each in five colors (160 pieces total). Development set has 10 pods each in five colors (400 pieces total). Each pod has 5 thick, 3 thin diamonds (shown at right). These are the tiles seen on the cover of Discover magazine some years ago. are made by Kadon under license. Two isosceles triangles have the interesting properties of forming ever larger models of themselves, and of modeling any parts of pentagon tilings. For example, two of the "wide" triangles joined on their long side form a thick Penrose diamond. Joined on their shorter side, they form a "dart." Join two of the taller triangles at their base and you get a thin Penrose diamond. Join them on their longer side and get a "kite". Much of this research was done by Ward Hollins, who named them "Collidescape" for their kaleidoscopic symmetries and non-periodic tiling elusiveness. Each pod: 5 wide, 3 tall triangles with 1.25-inch long sides, equal mix of five colors. Win a prize! We're looking for the smallest possible area enclosed by a 25-Arc loop with no overlapping pieces. Send us your best solutions, by email or snailmail.